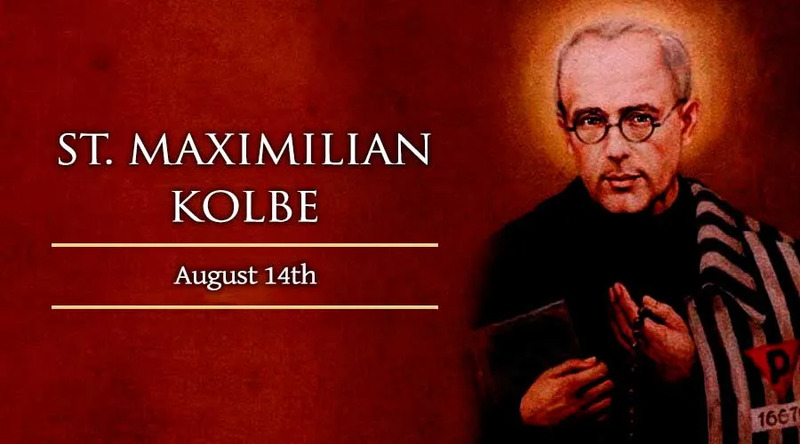 Saint Maximilian Kolbe, the Polish Franciscan priest, missionary and martyr, is celebrated throughout the Church today, August 14. The saint died in the concentration camp at Auschwitz, during World War II, and is remembered as a “martyr of charity” for dying in place of another prisoner who had a wife and children. He was canonized by Pope John Paul II on October 10, 1982. St. Maximilian is also celebrated for his missionary work, his evangelistic use of modern means of communication, and for his lifelong devotion to the Virgin Mary under her title of the Immaculate Conception. All these aspects of St. Maximilian's life converged in his founding of the Militia Immaculata. The worldwide organization continues St. Maximilian Kolbe's mission of bringing individuals and societies into the Catholic Church, through dedication to the Virgin Mary. St. Maximilian, according to several biographies, was personally called by the Virgin Mary, both to his holy life and to his eventual martyrdom. As an impulsive and badly-behaved child, he prayed to her for guidance, and later described how she miraculously appeared to him holding two crowns: one was white, representing purity, the other red, for martyrdom. When he was asked to choose between these two destinies, the troublesome child and future saint said he wanted both. Radically changed by the incident, he entered the minor seminary of the Conventual Franciscans at age 13, in 1907. At age 20 he made his solemn vows as a Franciscan, earning a doctorate in philosophy the next year. Soon after, however, he developed chronic tuberculosis, which eventually destroyed one of his lungs and weakened the other. On October 16, 1917, in response to anti-Catholic demonstrations by Italian Freemasons, Friar Maximilian led six other Franciscans in Rome to form the association they called the Militia Immaculata. The group's founding coincided almost exactly with the Bolshevik revolution in Russia, and the Marian apparitions at Fatima, Portugal. In 1930 he moved to Japan, and had established a Japanese Catholic press by 1936, along with a similarly ambitious monastery. That year, however, he returned to Poland for the last time. In 1939, Germany invaded Poland, and Fr. Kolbe was arrested. Briefly freed during 1940, he published one last issue of the Knight of the Immaculata before his final arrest and transportation to Auschwitz in 1941. At the beginning of August that year, 10 prisoners were sentenced to death by starvation in punishment for another inmate's escape. Moved by one man's lamentation for his wife and children, Fr. Kolbe volunteered to die in his place. Survivors of the camp testified that the starving prisoners could be heard praying and singing hymns, led by the priest who had volunteered for an agonizing death. After two weeks, on the night before the Church's feast of the Assumption of the Blessed Virgin Mary, the camp officials decided to hasten Fr. Kolbe's death, injecting him with carbolic acid.